Wondering how to utilize video strategically so that it can fit into your marketing? Well, you can learn through this article and discover tips and tool to incorporate video into your marketing campaigns. Create a larger base of engaged audience. As video content is easier than ever to make, you should still try to create content that supports your goals, instead of producing video content simply for the concern of doing it. Once you’ve come to know what your goals are, decide the best type of video which can get you these results. Below are some kinds of social videos you can make on the basis of your objectives. If your goal is to utilize video to improve sales, develop content which highlights your brand along with products and services. You can see this short Coca-Cola social media video ad that focuses their Coca-Cola Zero Peach drink. Animated videos are the resources that work for pretty much any goal, from how-to videos to videos promoting a brand or educational institute. Oreo is one name that utilizes animated videos on Instagram to highlight their products in order to encourage engagement and advertise their products. This OREO cookie goes out to the 420,408 #Pinball Players who know that the most delicious games have a milk target. Listicles are one of the most famous content forms because users can easily digest them. You can make useful listicles and turn them into videos to improve engagement and shares. See the example of Buffer’s Facebook video that highlights their three biggest social media mistakes. Live videos get great engagement, build trust, and improve conversions. Use live streaming videos to show behind-the-scenes looks around the office, share your conference appearance, and broadcast your brand’s interaction with influencers and industry leaders, and so on. Whether you have video clips or video content of your own to use or not, the good thing is that there is a number of tools to create impact videos. They are so user-friendly that you can create them in minutes. The video tool shown here is one of the most popular and high performing video creation tools. The tool always remains on the top of mind of social media marketers. Intro- Wideo is a popular video creation tool that helps you make your own animated videos. 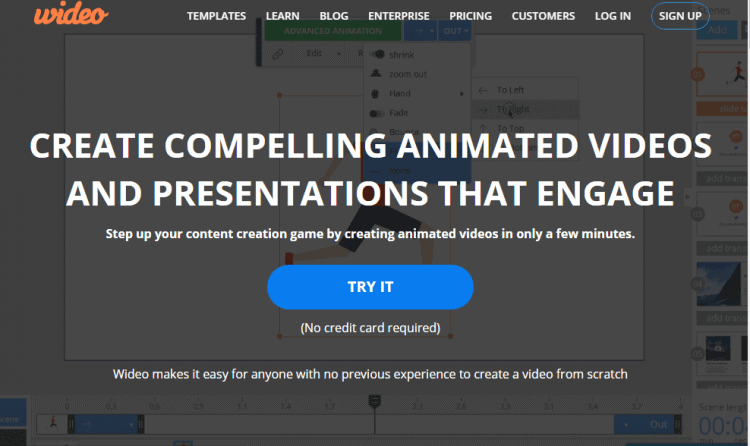 If you think animation videos are complicated, try this tool, an easy one to handle and create fabulous content. In fact, you can pick a template to start and edit it to convey your message. It enables you to edit the animation to add more scenes, choose images & objects and insert transitions. You can customize your videos with the features available in the drag-and-drop menu and also add text to your video. Price starts at $19 per month and billed annually. If you want to make a strong social video strategy, it won’t be tough as it happened to be. There are resources which can help you achieve your goals. This article will proffer you relevant tips and tool to create social videos.